18th April 2017 – London, UK – Musion Events, and its holographic technology provided further impetus to French presidential candidate Jean-Luc Mélenchon’s growing popularity in the forthcoming presidential election. 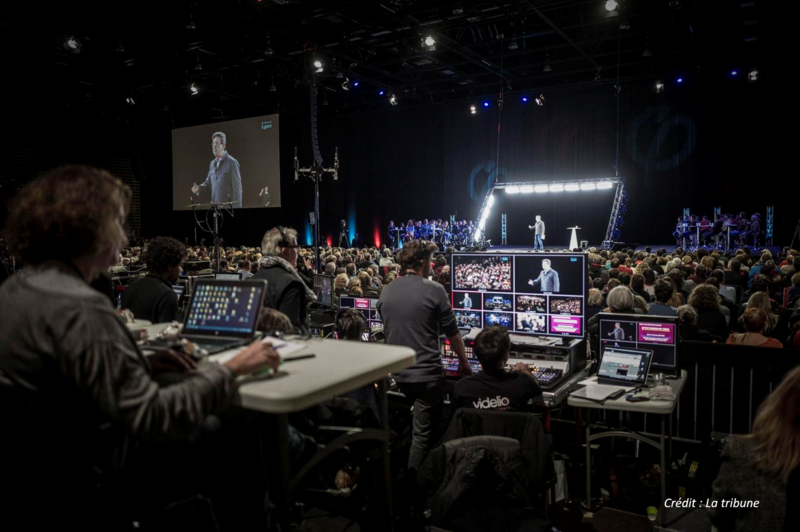 The live 3D interactive broadcast to multiple locations on April the 18th followed the highly acclaimed “Double Meeting” Lyon to Paris hologram address by Mr Mélenchon on February the 5th. Although initially a presidential outsider, this astonishing campaign has provided momentum over the past few weeks for Mr Mélenchon to leap 19 points in one month to bring him in close contention with the front runners Emmanuel Macron and Marine Le Pen for the first time. Mr Mélenchon’s latest use of the Musion Eyeliner™ technology reached out to a broad geographic audience, appearing in the flesh during a public rally in Dijon and as a live streaming hologram in the five French cities of Clermont-Ferrand, Grenoble, Montpellier, Nancy, Nantes together with the Reunion Island in the Indian Ocean. Mr Melenchon’s iconic political broadcast as a live hologram is a World first event of its kind. #LaForceDuPeople started trending shortly and Melenchon’s official Twitter account announced that 50,000 people were following the event live on Facebook and Twitter. The Patented Holographic Filming and Lighting ‘know-how’ for the holographic image capture as well as the ultra-clear Patented Flame Retardant Eyeliner™ Foil used for this event was provided by Musion Events Limited along with licensed partner Adrenaline Studio. Technical delivery for the event was project managed by leading French AV and event production specialists Videlio. Together these three teams delivered a political first spring-boarding Mr Melenchon’s campaign further upwards across a variety of social media platforms.